It’s been almost 12 years I started using Apache Tomcat. I believe when I did my 1st under grade project, it was on Tomcat version 1.x. Now it’s already on version 8.0. Mostly I’ve been in touch with Tomcat Server in my daily work life, simply can’t live without it. On Crunchify we have already published almost 40 articles on Apache Tomcat. In most of the tutorial I’ve run server on port 8080 which is default port configured in server.xml file. 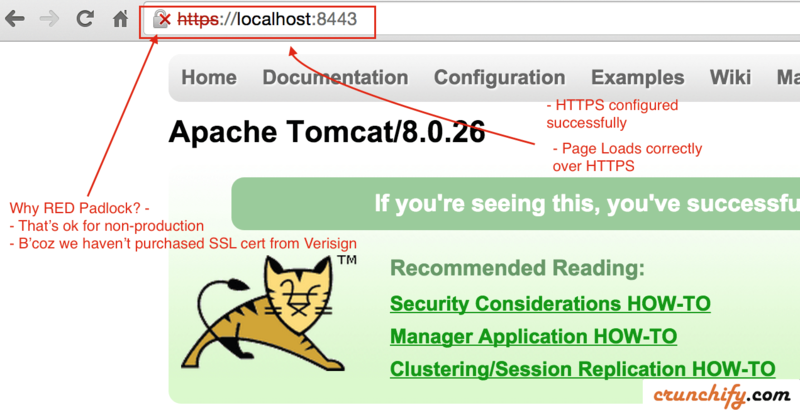 In this tutorial we will go over all steps in details on how to enable HTTPS/SSL on Apache Tomcat Server. keytool: we will generate secure key using keytool command – which is key and certificate management tool. I’m using Mac OS X, so replace your path accordingly if you are on windows. Start tomcat server using command: <tomcat_home>/bin/startup.sh. Make sure you are this location. Hit URL: http://localhost:8080 to make sure server is up and running. Now check port 8443 (HTTPS/SSL URL). Hit URL: https://localhost:8443 – you should see error message. Page shouldn’t load at all. Change server.xml file which is located at <tomcat_home>/conf/ folder and modify settings. In our case it’s /Users/<username>/Documents/apache-tomcat-8.0.26/conf folder. Look for below properties and add keystoreFile and keystorePass values. Here password is 123456 which I used in Step-1. and you are all set. Have you noticed red padlock? Don’t worry. We haven’t purchase SSL cert from Verisign or Comodo. In production environment you may not see that red cross sign. How to check your cert content using command keytool? How to Run Multiple Tomcat Instances on One Server? How to redirect any incoming request from non-secure (HTTP) to secure (HTTPS) call?